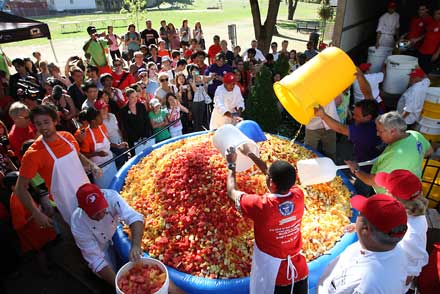 More than 200 McGill volunteers join forces to break the Guinness World Record for the largest fruit salad in the world at 11,197 pounds. And if you happened to walk by a beaming Laperle Tuesday afternoon on Lower Campus, standing in front of an 11,197-pound mountain of freshly cut fruit piled high inside a blue inflatable swimming pool, you might be inclined to agree with that original assessment. But if you took the time to look beyond the gargantuan mass of glistening fruit to register the smiles and pride that marked the faces of the hundreds of people who squeezed in around that pool, you might reassess that opinion. Students, staff, faculty and administration – all volunteers of the record-breaking effort – standing side by side and applauding themselves as Amanda Mochan, the Guinness adjudicator announced that McGill had in fact established a new world standard. But what made the record even sweeter was, at day’s end, more than 60 per cent of the salad would be donated to a number of the city’s charities, including Moisson Montréal, the Old Brewery Mission, Dans la Rue, Welcome Hall Mission and Meals on Wheels. In addition, about 300 portions of the salad will be sold in McGill cafeterias, the proceeds of which will be donated to Centraide. “I taught him everything he knows,” said de Volpi’s mother, Kathy, with a wry grin, as she put on an apron and waded into the cutting tent. Inside the tent, which just days before had served as the Parents’ Tent, shifts of some hundred volunteers in hairnets – which included Principal Heather Munroe-Blum – stood in rows cutting a seemingly endless supply of honeydew melons, apples, pineapple, cantaloupe, strawberries and other fruit. Volunteers weaved in and out of the rows of tables with wheelbarrows of watermelon, making sure the cutting never stopped. The floors stayed remarkably clean and dry, with people on brooms patrolling the area to sweep up any stray strawberry that hit the floor. The whole scene was surveyed by teams of McGill chefs who, when they weren’t cutting fruit themselves, offered quick lesson to volunteers on such basics as the proper technique to core a pineapple. In all, some 5,000 pounds of watermelon, 1,300 pounds of cantaloupe, 1,000 pounds of honeydew, 2,250 pounds of pineapple, 220 pounds of apples and 360 pounds of strawberries were used in the record-breaking salad – with about 60 per cent of it coming down Hwy. 20, from the Macdonald Campus Farm. On top of the occasional hungry wasp, the event attracted people from all walks of life, including at least three local politicians. Marc Garneau, MP for Westmount-Ville-Marie did his part at the cutting board, chopping honeydew melons and eviscerating pineapples. The first Canadian in space, and a man who took part in three missions aboard NASA Space shuttles, Garneau admitted how much fun it was to be part of the event. “Of course it’s exciting,” he said with a laugh. “I’ve never been a part of a Guinness world record. Also on hand was Mike Bleho, a technician in the Dept. of Plant Science and the man at Macdonald Campus who oversaw the planting and care of the thousands of pounds of fruit that was supplied by Mac Farm. “What an amazing feeling,” he said as he watched bucket after bucket of Mac produce being poured into the large inflatable pool, just minutes away from breaking the record. “The atmosphere in the [cutting] tent was electric all day. When Mochan announced that McGill had set a new world record with a fruit salad of 11,197 pounds, the crowd, which included volunteers, organizers, local media and throngs of curious passersby, erupted in applause. She then presented Laperle and de Volpi with the official Guinness certificate commemorating the accomplishment. And de Volpi and his team immediately went about doling out fresh fruit salad in compostable cups to everyone, even people who just happened to be passing through campus. The late afternoon sun shone down upon a bucolic scene of happy, smiling people gathered together on the field on Lower Campus enjoying a sweet, nutritious salad made with local produce – the fruits of their labour. Congratulations – what a great idea, superbly followed through! I hope oli brings some salad out to poker nite!!! I think they all did a wonderful job. My daughter was one of them. I am very proud of u Jennifer Clarke. Congratulations. Hope McGill we’ll win more records! Wish I were there to help with both the making and the eating! Congrats from Boston! A well thought-out and executed initiative–kudos to everyone involved!